I have talked about Dealspotr at length since I joined several months ago. If you haven’t heard about it yet, I’m really sorry because I talk about it all the time. The best thing about Dealspotr is that the fabulous people that run it are always trying to improve it. I joined when it was new and through feedback (they really listen to user feedback) it has gotten better and better in just a few short months. Dealspotr is a sharing site for the best deals. Think, Facebook – but only for deals. You have a profile page where you can post deals you find (super easy to do with their “fill-in-the-blanks” forms for submitting deals) and then you have a newsfeed where deals from stores or other Dealspotrs you follow have posted. For example, if you follow me on Dealspotr, you’ll see every deal I post. If you follow, Target, for example, you’ll see every deal another Dealspotr has posted at Target. So you have complete control over the deals you see. So you’ve signed up. Then it’s going to ask you to pick a few categories you’re interested in like grocery deals, fast food, fine dining, fashion, food and cooking, grocery freebies, family restaurants, travel, etc. You’ll select a few from that list. It is not a complete list of brands on Dealspotr – nor do you have to worry about getting them all in. If you forget to click on, you can always add more brands later. 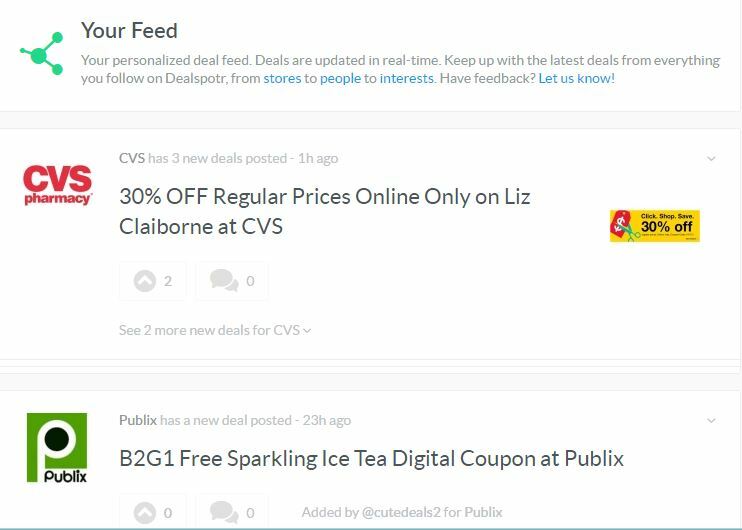 These two screens are just to help Dealspotr generate a Deal Feed for you to get started with. Your deal feed, known appropriately as “Your Feed” is where you’ll find deals from the categories and brands you have chosen to follow. So since I chose CVS and Publix as some of my brands to follow, you can see them right there on my feed. I also have the option under each one to “see more new deals” for whatever store or category. I can click that and check out all the new posts about CVS or whatever store I’m viewing. This part of it is totally customizable. You can set it up so that you see ONLY the stores and deals you want to see. Then each day you log in to Dealspotr and go to Your Feed and there’s what you want to see. All the deals you want just waiting for you. Yeah, but how do I earn Amazon giftcards? You earn points for sharing deals, spotting (curating) deals, flagging invalid deals, referring new members, making helpful comments, and many other actions. Whenever you earn points, you’ll receive a notification in your Dashboard alerting you to your new points and why you earned it. Every 10,000 points earns you a $10 Amazon gift card! And I’ve already told you that signing up with this link earns you 5000 points right away! And when you first sign up, look on the left side of your screen and you’ll see your daily checklist. This changes every day, but right after you first sign up it will tell you to confirm your email address, update your profile, share a deal and “spot” 5 deals – then you’ll get 200 points for completing your checklist. So let’s talk about sharing deals! 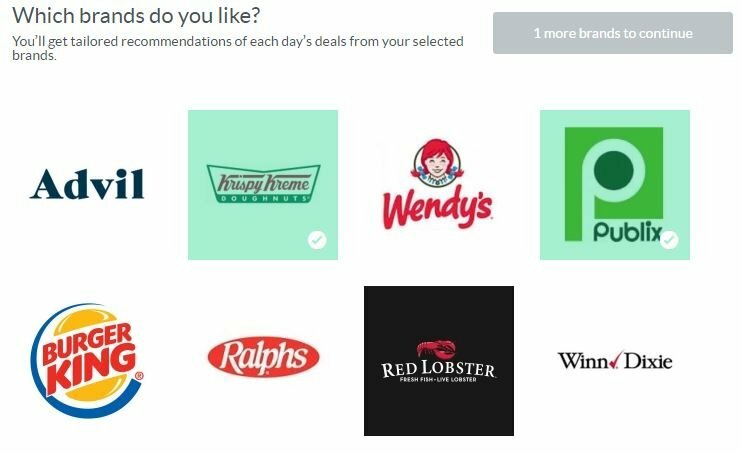 YOU can share deals with the Dealspotr community! I often don’t look any farther than my email inbox for help with that. Did Gymboree send me an email about their new sale? Great! I hop on over to Dealspotr and share it! Did Kohl’s email me the new coupon code that started today? Great! You guessed, I go share it on Dealspotr! Then I am awarded points for sharing deals! Now what does it mean to SPOT deals? When you spot a deal it just means that you are acknowledging that this deal is legit and it’s really good. Notice the part above that I circled in pink. That means 5 people spotted that deal. So I decided since I love Kohl’s that I would spot the deal too. I know the deal is legit because I saw the same code on their website. So now you see that the arrow is green, that means I’ve spotted it, and the number has gone up to 6. If a deal that you spot is deemed HOT or ON FIRE, then you get points for helping spot a great deal! Well, first off, you’re only allowed so many spots per day. That number goes up as you advance through Dealspotr’s rankings. And second, if you spot a bad deal (like a coupon code that isn’t real or a deal that was posted after it was expired – like tonight I saw a restaurant deal that was posted today that was valid only on Father’s Day – which was a week ago – that’s a bad deal) then you LOSE points for spotting a deal that turned out to be bad. This ensure that only the good deals circulate through Dealspotr. After you sign up, you can refer your friends and you earn points when they earn points! Finally, and above all else, USE Dealspotr! When you want to shop online at your favorite store, check Dealspotr for a coupon code first! 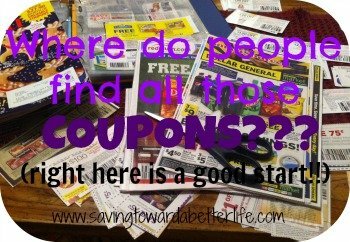 I don’t think there is a store in existence that can’t be found on Dealspotr – making it the most comprehensive coupon code sites! So what are you waiting for? 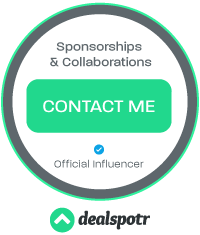 Join Dealspotr today! Plus, if you sign up using this link you get 5,000 Karma points automatically! That’s halfway to your first $10 gift card!